These images reflect not only our experimental interests and techniques, but the extraordinary shapes and forms in nature. 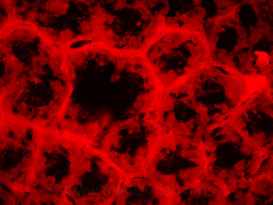 Early epithelial-mesenchymal transition of the lung pleura after pneumonectomy (red is alpha-smooth muscle actin). 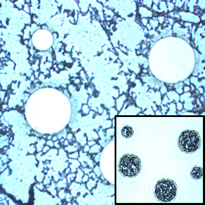 Cellular dynamics during the early stages of bleomycin-induced lung injury. 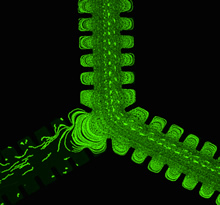 Flying through" a postnatal rodent airway courtesy of synchrotron imaging and computerized reconstructions. 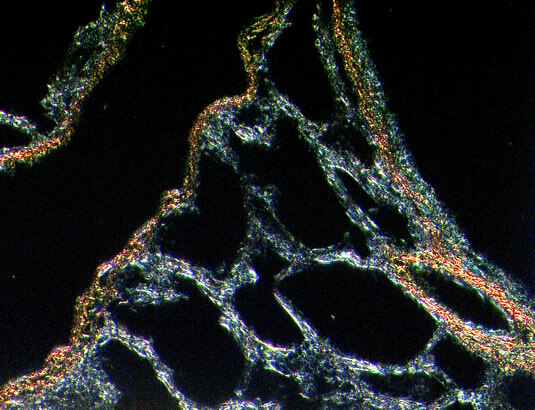 Sirius red staining of postnatal rat lungs examined under polarized light microscopy. 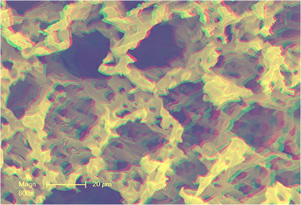 3-dimensional structure of the lung extracellular matrix; light microscopy of precision-cut lung slice. 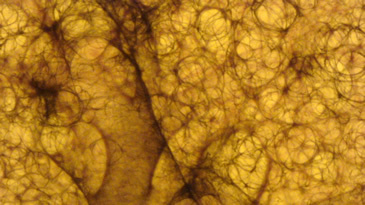 Surface dynamics of the chick chorioallantoic membrane as reflected by free-flowing orange fluorescent microspheres. 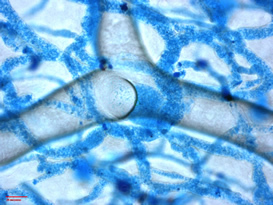 The lumen of the normal colon after fluorescent vessel paining (red) and counterstaining with a blue nuclear dye (DAPI). 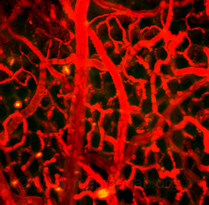 Lung blood vessel after migration of green fluorescent cells (cross-circulation), perfusion with fluorescent lectin (RCA-1) and counterstaining with a blue nuclear dye (DAPI). 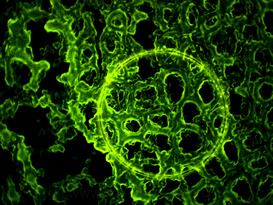 Panoramic 3D reconstruction of the skin microcirculation (multiple images digitally "stitched" together) after green fluorescent polymer injection and confocal imaging. 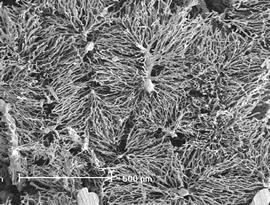 Scanning electron micrograph of the superficial mucosal plexus in the ascending colon after polymer resin injection and tissue corrosion. 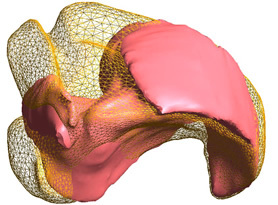 Finite element model of the changing shape of the murine lobes after surgical resection. Flow through an alveolated and bifurcated microfluidics chamber with differential runoff resistances. 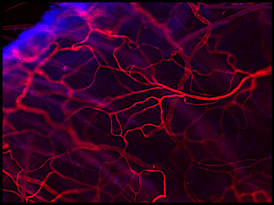 Intravital fluorescence microsocopy and digital recombination of 120 images of 500nm red fluorescent microspheres moving through the colon microcirculation. 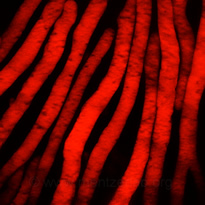 Wall of an inflammed colon with red fluorescence marking the distribution of mononuclear phagocytes. 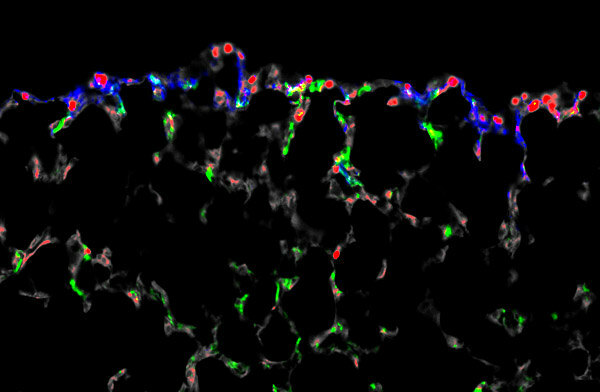 Biotin-labeled mesothelial cells (blue) demonstrate local migration into the subjacent lung (multi-wavelength cell scoring). 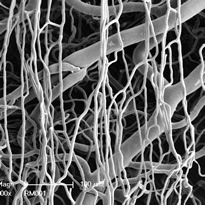 Tropoelastin spheres interact with protein scaffold in the development of cable line element. 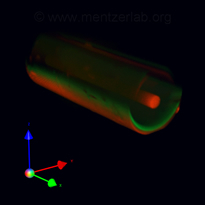 3D reconstructions of 25um microcapillary tubes variously containing 500nm blue, green and red microspheres in either green or red fluorescent plasma markers. 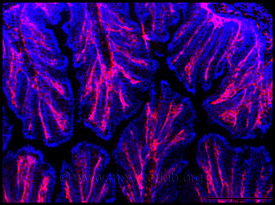 Whole mount fluorescent micrograph of the colon after fluorescent vessel painting. 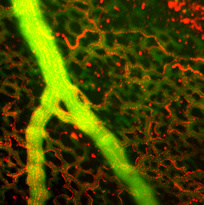 Separate green and red imaging confocal imaging a 20um microcapillary tube followed by 3D digital reconstruction. 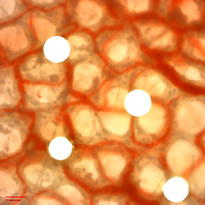 Scanning electron micrograph the luminal surface of the inflammed colon after polymer resin injection and tissue corrosion. 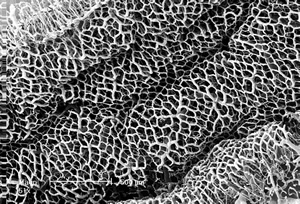 Mechanically stretched skin capillary imaged by scanning electron microscopy after polymer resin injection. 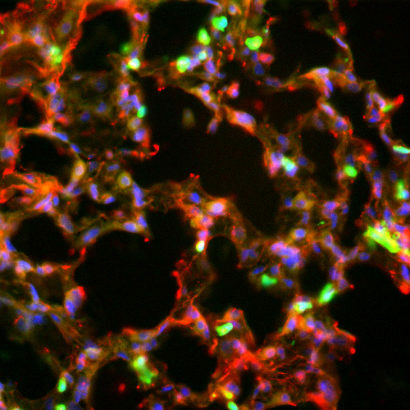 Confocal fluorescence micrograph of green fluorescent cells (cross-circulation) migrating into the lung; monocytes counterstained with red fluorescent dye (note yellow cell co-localizing the fluorescent dyes) and blue nuclear dye. Colon serosal vessel after fluorescent lectin (RCA) injection and imaging in a whole mount preparation. 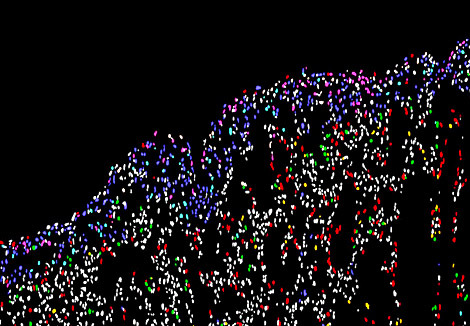 Digital recombination of 300 images of 500nm red fluorescent microspheres moving through the colon microcirculation. 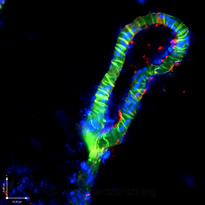 3D reconstruction of the colon microcirculation after green fluorescence-labeled polymer resin injection and whole mount preparation. 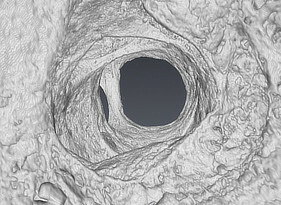 3D reconstruction of the blood vessels in a post-pneumonectomy lung; raw data obtained from work in the Paul Scherrer Institut (SLS; synchrotron). 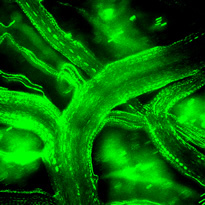 Chick CAM microcirculation after treatment with angiogenic growth factor; imaged with green fluorescent plasma marker and intravital microscopy. Superficial mucosal plexus of the colon microcirculation after perfusion with a lectin (LEL) and "thick tissue" mounting for laser capture microdissection. 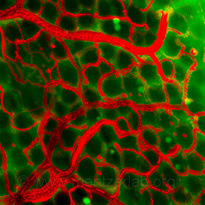 Confocal micrograph of the green-fluorescence labeled chick chorioallantoic membrane blood vessels. 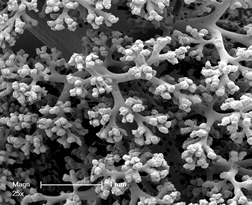 Anaglyphed 3D (tilt-angled) view of lung alveoli corrosion cast (SEM). Best viewed with red cyan glasses. 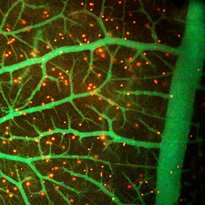 Grid confocal imaging of the retina after injection with a red fluorescence plasma marker. 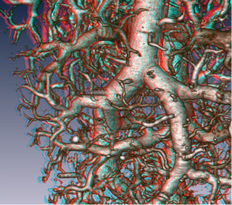 Panoramic 3D reconstruction of the chick chorioallantoic membrane microcirculation (multiple images digitally "stitched" together) after blue fluorescent polymer injection and confocal imaging. 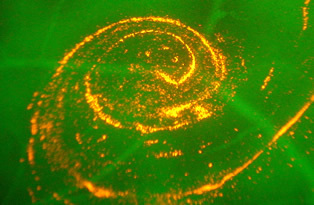 Chick CAM microcirculation responding to tissue graft; vessels imaged with green fluorescent plasma marker and orange fluorescent flow tracers (microspheres). 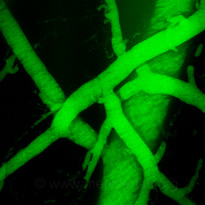 Light micrograph of a whole mount prepared for laser capture microdissection after injection of a blue polymer resin. 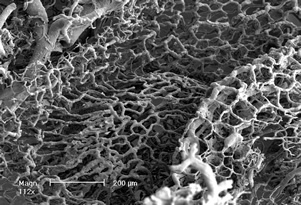 Skin microvessels imaged by scanning electron microscopy after polymer resin injection and tissue corrosion. Velocity profile of blood flow around an intussusceptive pillar in the chick chorioallantoic membrane. 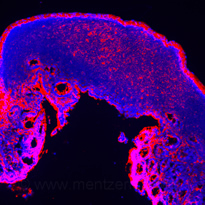 Ultraviolet laser microdissection definition of a portion of the colon mucosa after intravascular injection of a green fluorescence plasma marker and whole mount preparation. 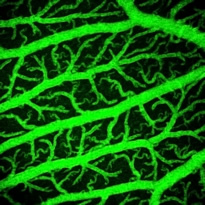 Grid confocal imaging of the chick chorioallantoic membrane vessels after vascular casting with a green fluorescence polymer resin. 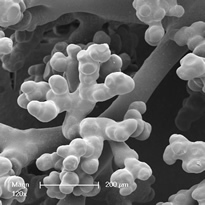 Corrosion cast and scanning electron microscopy of the developing airways and rudimentary airsacs (alveoli). 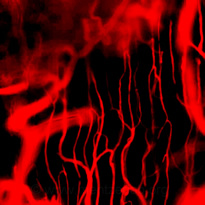 Laser capture microdissection of regions of the colon microcirculation injected with red ink; vessels captured for subsequent molecular analyses. 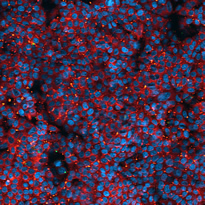 In vitro cultured cells stained with fluorescent nanoparticles (red) and counterstained with a nuclear dye (blue). 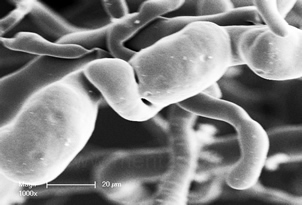 Scanning electron micrographs of casts of the developing airway; early septation of the alveolar airsacs is seen. 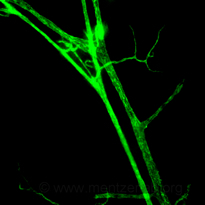 Grid confocal imaging of the chick chorioallantoic membrane after injection with a green fluorescence plasma marker. 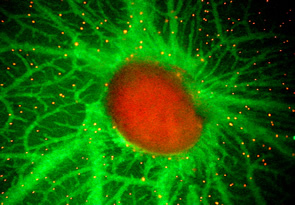 Intravital fluorescence microscopy of 500nm orange microspheres flowing through the chick chorioallantoic microcirculation highlighted by a green fluorescence plasma marker. 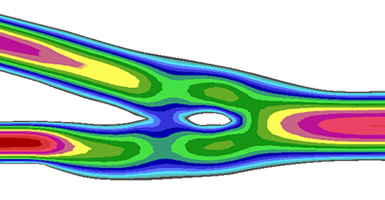 Finite element model of breathing movement of a section (lobe) of the murine lung. 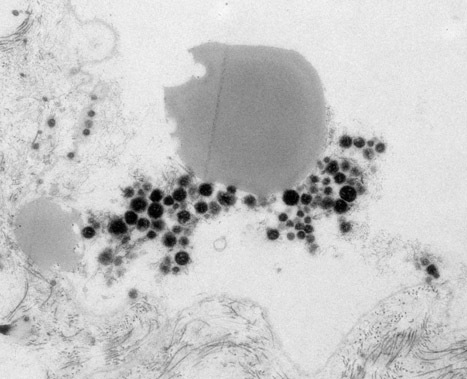 Laser capture microdissection of regions of the lung captured for subsequent molecular analyses. 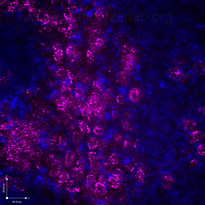 Acute colitis staining of proliferating cells (pink, Ki67) and counterstained with a blue nuclear dye (DAPI). 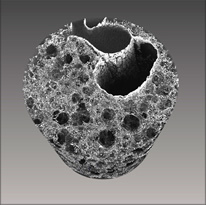 Anaglyphed 3D (tilt-angle) view of lung vessel corrosion cast (microCT). Best viewed with red cyan glasses. 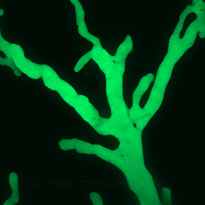 Timelapse imaging of green fluorescent platelets and red fluorescent plasma marker in the inflammed colon microcirculation. 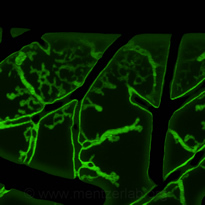 Timelapse reconstruction of red microspheres in the inflammatory colon microcirculation (green fluorescent plasma marker). 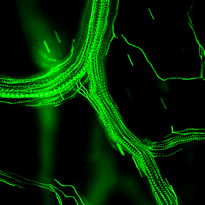 Digital recombination of 300 consecutive (20msec interval) images of green fluorescent 500nm microspheres in the CAM microcirculation. Digital recombination of green fluorescent microspheres in the CAM microcirculation. 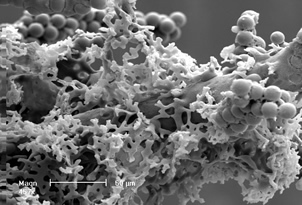 Corrosion casting and scanning electron microscopy of the liver microcirculation. 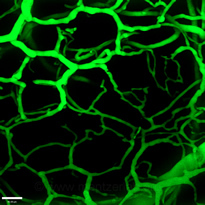 Fluorescent vessel painting of the skin mcirocirculation (whole mount; banded structures are hair fibers). 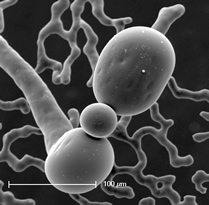 Corrosion casting and scanning electron micrograph of microspheres defining the connection between the bronchial and pulmonary microcirculation. 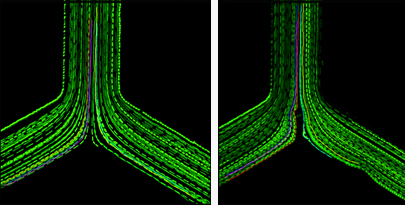 Digital recombination of microspheres in PDMS microfluidics flow chamber simulation of vessel bifurcation (left without pillar; right with 10um pillar). 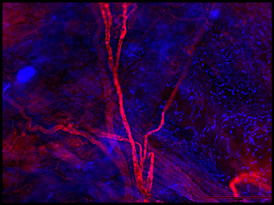 Fluorescent vessel painting of the skin mcirocirculation counterstained with blue nuclear dye (whole mount).